A new study into the motivation of those involved in the Union Flag protest should be honestly addressed by politicians and not turned into a political football, the organisation who commissioned the report has warned. The report: ‘Flags and Protests: Exploring the Views, Perceptions and Experiences of People Directly and Indirectly Affected by the Flag Protests’ is understood to be the first academic attempt to examine the motivation of those involved in the year long flag protests. The research, commissioned by the Intercomm peace-building agency, was carried out by Dr Jonny Byrne, a lecturer at the University of Ulster’s School of Criminology, Politics and Social Policy. The flag issue and the expression of cultural identity remains one of the most controversial topics currently being discussed by the all party talks being chaired by Richard Haass. Over a six month period earlier this year Dr Byrne interviewed separate focus groups of women and young people who had taken part in flag protests. In an effort to understand the wider societal impact of the protests, Dr Byrne also interviewed a group of 12 church leaders and discussed the personal experiences of police officers involved in the flag protests with the PSNI. The author points out that the research does not attempt to judge the rights or wrongs of those involved in the flag protest, but instead attempts to provide a “window of understanding” into the thinking of those at the centre of the ongoing demonstrations. The report’s main finding identifies a growing sense of alienation within some sections of loyalism, which was brought to the fore with the start of the flag’s issue in December 2012. It concludes that a section of loyalism is now “completely disengaged” from the political institutions, with many believing that mainstream unionism has abandoned them. Many of those interviewed felt that they were no longer allowed to include unionist/loyalist cultures and traditions within the new Northern Ireland. The report also raises the concerns of some church leaders that the growing disconnection with mainstream unionism could lead to an increase in militant loyalism. Intercomm director Liam Maskey, whose organisation commissioned the research, said it was vital that the report’s conclusions are addressed “openly and honestly”. “It is imperative that society as a whole considers the detail contained in this research,” he said. “No single section of society, nor one single government department can look to deal with these matters alone and neither should they be asked to. To take these matters seriously, all strands of our society needs to take these research findings on board." Mr Maskey said the research was a “necessary first step” to understanding the sense of alienation within some sections of loyalism. 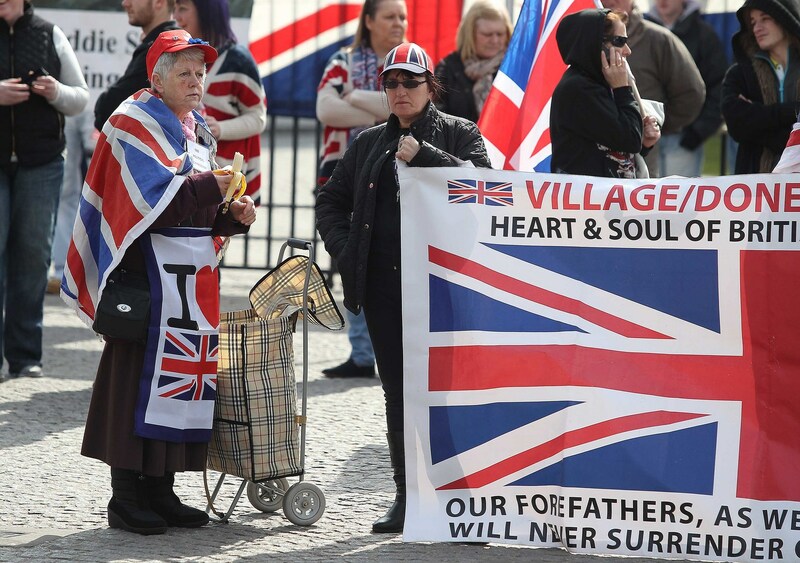 “This research is a lens into the deep-seated cultural and identity grievances – perceived or real – within the loyalist community. Intercomm worker Winston Irvine said that the research had provided a necessary platform to allow the concerns of those involved in flag protests to be heard by wider society. However Mr Irvine admitted that the report highlighted a number of challenges for both communities and the Stormont Executive. “For loyalists there is a challenge about how they transform that anger and frustration and turn into a positive endeavour that speaks to what is important to them. “There is also a challenge for republicans in how they relate to British identity and its manifestations in the context of a shared future and in a spirit of respect and acceptance. “And there are also governmental challenges in terms of the responsibility to provide a proper framework for addressing the issues that have been identified throughout the report. On December 3, 2012 Belfast City Council voted that it would only fly the Union Flag on 18 designated days. Nationalist councillors had initially proposed that the Union Flag should not be flown from the city hall at all, but agreed an Alliance Party amendment that the flag would only fly on designated days. In the following months large parts of Northern Ireland, but Belfast in particular, witnessed major public disorder with widespread street demonstrations, estimated to have cost the local economy tens of millions of pounds in lost revenue and in to police the protests. In response to rioting, hijacking, attacks on politicians, illegal processions and threats on social media websites, the PSNI launched Operation Dulcet. By October 2013 more than 520 people had been charged or reported for public order offences from the start of the flag protest. Two focus groups of female flag protesters agreed to take part in the research. Women were seen as playing a pivotal role in the protests. They claimed that in the first six weeks of the protests the PSNI had been “accommodating” and “supportive” of what protesters insisted had been legitimate peaceful demonstrations, which involved loyalists blocking main thoroughfares during rush hour traffic. “At the start you didn’t really see the police, they managed the traffic and let us get on with things,” one interviewee told researchers. However there was criticism that the PSNI’s style of policing the protests changed to become aggressive and antagonistic in response to nationalist criticism of how police were handling the demonstrations. The report found that the protest has resulted in a significant breakdown in relationships between the PSNI and female flag protestors. Some female protesters stated that they had stopped co-operating with the PSNI as a result of the protests. However the sense of betrayal felt by female protestors was not only towards the police. Some openly criticised males within loyalist communities for failing to support the protest. A group of church leaders from across the religious divide also agreed to take part in the research. Some clergymen felt that the flag protests were a rational response from a section of the loyalist community who felt vulnerable and left behind. However, generally it was felt that the wider public was ambivalent to the demonstrators and their reasons for protest. Some church leaders felt that the protestors’ argument had been lost as a result of the violence and street blockades. One theme that dominated many of the conversations with clergy was the impact of the protests on relationships both, within and across, communities. There had been tensions within loyalism over some people who refused to take part in the protest. Church leaders were fearful that the alienation felt by flag protestors against mainstream unionism could lead to militant loyalism becoming more powerful. Some clergymen felt that politicians had lost control of the protests. Demonstrators didn’t seem to identify with unionist politicians, and at times, attributed blame to them. The report interviewed a group of young people, aged between 17 and 21, who had taken part in the flag protest. The young people believed that the PSNI, politicians and wider public had underestimated the anger that had existed within loyalism over the perceived sense of cultural loss which had been crystallized by the flag protest. The report expresses serious concerns at the sense of alienation which young people felt towards the PSNI’s handling of the protest and a belief that they will not be allowed a shared role in the ‘new’ Northern Ireland. “There is no doubting the lasting negative affects these will have on long-term engagement (with the PSNI)…. the young people’s views of the future are worrying. A senior PSNI officer said that said the wider community had incorrectly assumed that policing the protests had been straightforward. “In the minds of both communities, the issue of the flag soon became secondary and it was all about the role of the PSNI, and whether we were upholding the rule of law,” he said. The PSNI said it had once again found itself having to manage the consequences of political and communal disagreements. 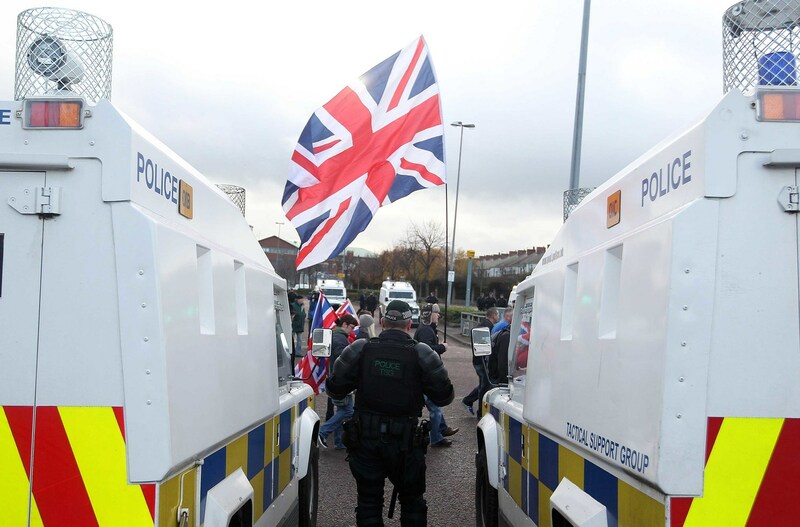 Police told researchers that one of the challenges for the PSNI throughout the flag disputes had been identifying individuals who could speak for the protestors. The report acknowledged that while the year-long protest has failed to overturn the city hall decision the protesters still believe they have achieved the aim of providing a voice for an unaddressed anger within loyalism. The study states that there is now a widespread belief within loyalism that both the peace process and the Assembly Executive’s policy of a ‘shared future’ favours nationalism. The report’s author Jonny Byrne said that the study identified significant questions for the future of loyalism. “The report raises fundamental issues about how loyalism will exist in the future, and what its contribution will be towards a shared and cohesive society,” he said. “The challenge is for loyalism to articulate and demonstrate its positive aspects and reinforce the belief that the new Northern Ireland needs a confident and vibrant loyalist culture”. However Dr Byrne said that the communal damage caused by flag issue was not irreparable. “It will only be fixed, whatever fixed looks like, in a political context. “Belfast is a diverse city. No one community is the majority or dominant community. “The answer lies in compromise, whatever compromise looks like. “It is not for me to determine, but the reality is we cannot have what we had in the past, and we cannot maybe have what we have now.